My city has been in the news a lot because of the deaths of five brave servicemen. The last of the funerals was held yesterday. I have been to a whole lot of funerals as a minister. Even when I was young I had to go to a lot of funerals because my dad was a preacher – and guess who performed all the funerals for family and friends? It seemed like every other week someone would call on my father to preach someone’s funeral, and most were people I did not know. Unbelievably, however, there are a lot of people in this world (especially America) who have never had to deal with the loss of someone really close, like a parent, sibling, or spouse, not even a grandparent. There are a lot of adults who have never even been to a funeral. For them, as it was for me, heaven is just a place they may believe in, but it’s not really thought of much in terms of an actual destination – like it’s only a metaphor. All that changes in an instant when a believing loved one dies. Four days later I knew what he meant. For me, heaven is a real place, a place where I long to go. Over the last few years more and more people have gone on ahead of me and are waiting. Right now there is a silhouette of golden light tracing the edges of the dark mountain before me. What is on the other side I can barely imagine – I’ve only heard stories. But one day, maybe not long from now, I will receive the call to cross over. There my faith will be made sight. It’s just a matter of time before I learn what “real” is all about. He Forgave. So Can We. Not long ago I had the chance to go to an outdoor music festival in Chattanooga. It was there at JFest that I met an incredible couple, Tiki and Tom Finlayson, with a powerful story to tell. 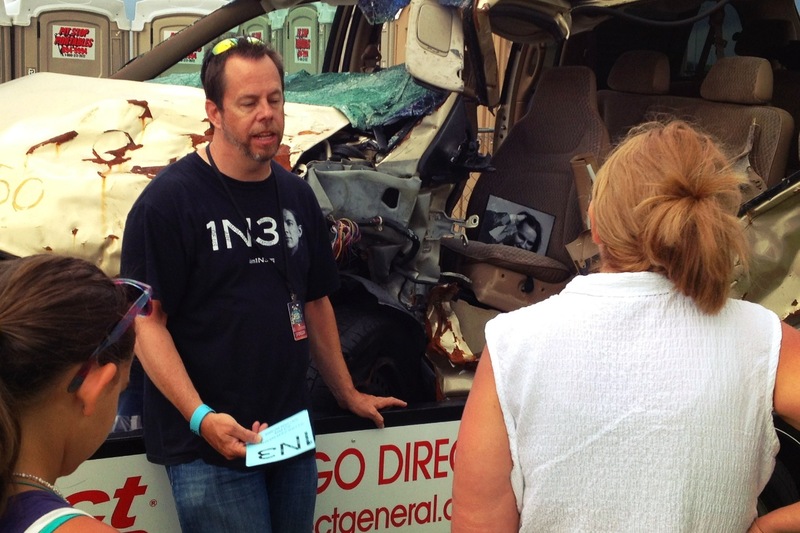 On July 31, 2011, a young man was hit head on by a drunk driver. 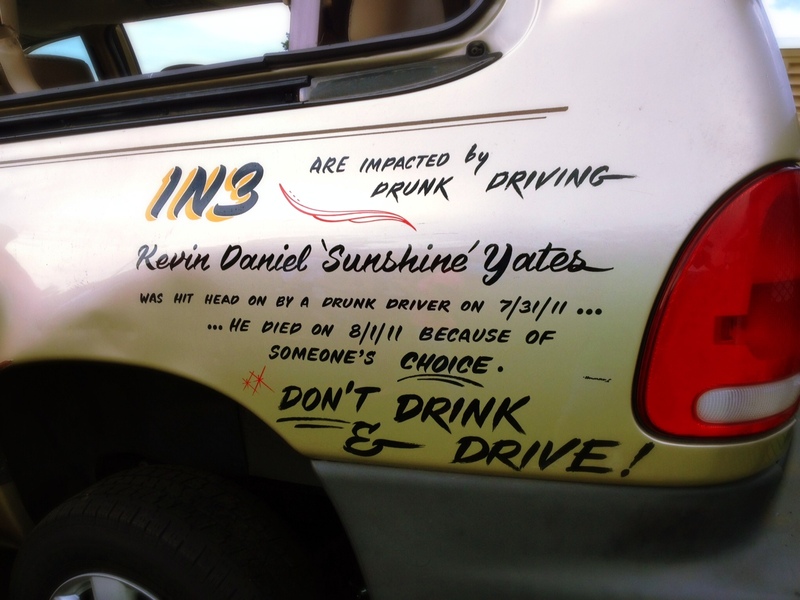 On July 1 Kevin “Sunshine” Yates died from the injuries he received in the crash. The tragic loss of a son could have driven his parents crazy, but instead of living with hate and bitterness, they decided to do something radical – the decided to forgive. 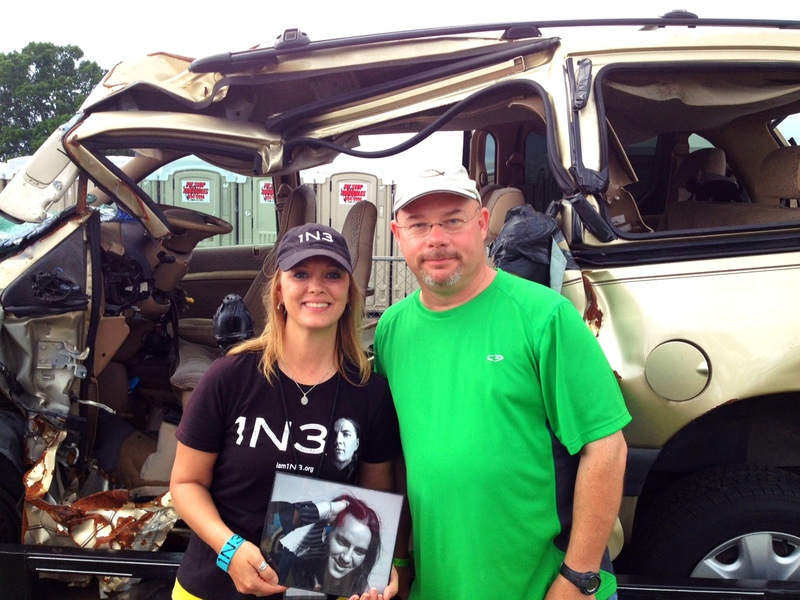 I would encourage you to go check out the website for 1N3, the ministry that Kevin’s mother and brother (Derek Yates) founded to increase awareness of the tragedy of drunk driving. There you can read the whole story of what happened, about Kevin, and about the lives that have been saved through organ donation. But for now, I would just like to share with you what Tom, Kevin’s dad, told me as we stood looking at the van Kevin was driving. I know people who have a hard time forgiving others for wrongs done. Others I know have a hard time getting past the death of a loved one; always grieving, always mourning the loss. The Yates and Finlaysons are not that way. All it takes is one look at the smiles on their faces to see that hope and love have drowned hate and bitterness. Tiki Finlayson and me. They carry the van around to show what happens when people drive intoxicated. The picture is of Kevin Yates, her son. As we stood there talking, Tom Finlayson told me how that they had truly forgiven the lady that had hit Kevin. As a matter of fact, they have reached out to help her. Believe it or not, she is even scheduled to help in their ministry upon her release from prison. Tom Finlayson telling the story.